After arriving in Malaysia, job one is to change your money to the local currency, the Malaysian ringgit (the name means "jagged", deriving from the serrated edges of the Spanish silver dollars that circulated throughout the region after Melaka fell to the Portuguese). As a fairly advanced market economy, Malaysia allows its visitors to use cash, traveler's checks, and credit cards with ease across the country. Expect very few problems changing your US dollars for ringgit in any of the many money changers or banks throughout the country. The Malaysian ringgit (MYR) is Malaysia's official unit of currency. 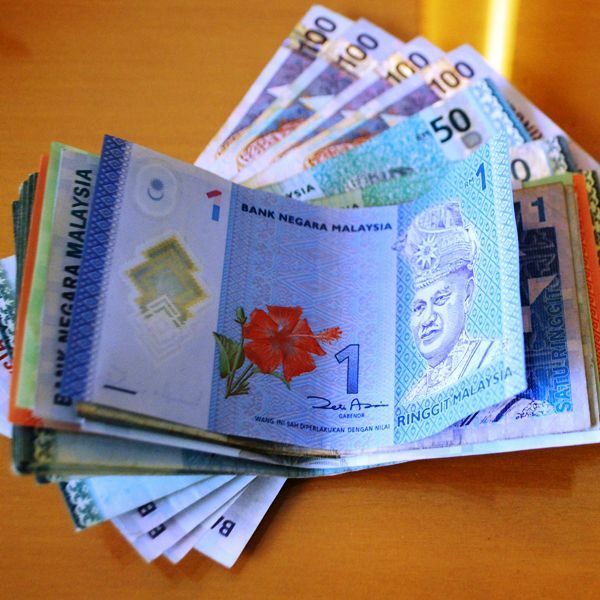 Paper notes are denominated in MYR1, MYR5, MYR10, MYR50, and MYR100. Coins come in 5, 10, 20, and 50 sen denominations. Polymer-based money is being slowly phased in; many of the blue 1-ringgit notes in circulation are now made of plastic, with a clear window in the middle. As an advanced, middle-income state, Malaysia possesses a fully developed banking and exchange system. US dollars or other foreign currency can be changed in banks and authorized money changers everywhere. The best rates can be found at banks and authorized money changers. Money changers in Malaysia. Money changers can be found wherever tourists congregate and provide good value for your foreign currency. These establishments accept major world currencies and some regional ones (Euro, US dollar, Singapore dollar, and Indonesian rupiah). The day's rates are commonly posted on the outside of the establishment for your quick reference. Money changers will only accept banknotes in good condition, so if you're bringing out a bedraggled one dollar bill that's been through the washer a couple of times, forget it. Hotels. In the absence of a conveniently-located money changer, you can have your currency changed at your hotel, but the rates compare poorly next to banks' and money changers'. Automated teller machines are easy to find in Malaysia's cities, and provide a cost-effective and safer way to get local currency (assuming your home bank's fees aren't that prohibitive). ATMs in Malaysia can be found at major bank branches, shopping malls, and air and land terminals. If your home bank is part of the Cirrus or Plus global ATM network, look for an ATM that carries the same network signage as your card. You can withdraw currency from your credit card, too - MasterCard holders can withdraw from Cirrus ATMs, and Visa cardholders can withdraw from Plus ATMs. Depending on your own bank's limits, most ATMs will allow maximum withdrawals of about MYR 1,500 per transaction and MYR 3,000 per day. Machines will dispense notes in MYR 10 and MYR 50 denominations. Major department stores, mall outlet stores, restaurants, and hotels accept credit cards. Local credit cards use the "chip and pin" system that incorporates a security-strengthening smart chip into the card; your credit card may be refused if it lacks a smart chip. The further from the cities you go, the less likely you'll be able to use your credit card. Be sure to bring enough cash with you when venturing out into the boondocks. Tipping is not a common practice in Malaysia; most bills incorporate a 10 percent service charge into the transaction. Generally, Malaysian establishments do not expect a tip. But if you leave loose change behind on the bill when leaving a restaurant, or leave a tip of MYR 2 to MYR 10, this courtesy will not be refused.